Commencement of Coraesine Forest was a free event held May 11-13, 2018. Below is the information gathered so far from official forums, email announcements, and various other official communication channels. 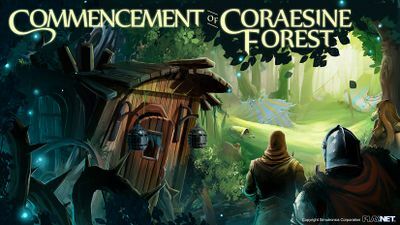 Coraesine Forest will be a permanent fixture of the game world after the grounds are opened. Coraesine Forest is located off Sylvarraend Road in Ta'Illistim. It is south of Gyldemar Forest and east of Sylvarraend. There is no bank on the grounds and there will be no transportation to the event. Make sure to be prepared to make a journey! You will be able to win multiple MAJOR services with a very steep silver surcharge. That surcharge grows VERY rapidly. There are no restrictions on item and/or silver passing. The surcharge costs for Major win selection is below. Surcharge is tracked for both the account and for the item separately and are added together for total cost of the surcharge. Example One: If you are receiving your first service and the item has no prior CCF work done, the surcharge will be ZERO. Example Two: If you are receiving your second service but the item has already had three services, your surcharge will be 5mil + 125mil = 130mil. Any fees associated with the selection process do not count toward the fees of the service. The cost of services will be determined by the service you are receiving and the item properties you already have, if applicable. Item restrictions may apply on some scripted items. Auction is the preferred method to dealing with some of the highest services (permabless, spell knowledge, glamour tattoo, defusion, coraesine, briar (tier 3), weight reducing, etc). Reserves (which will be the MB) will be 100m to 300m depending on which. Rune tattoos and x/day are 10m. Any possible additions will be added to Friday after midnight (EDT). Friday and Saturday are MAJOR services only. There are over 350 MAJOR services currently scheduled for the event. Selection methods will be up to the merchant, but will likely be something quick like a spinner, list, or raffle. Pre-made items and services are likely to be auctioned. ‡ indicates +1 tier up; the scripted ability must already be applied to the item. § indicates premade items, or items for which a base is chosen by the winner and the item is created (see specific services for details). 21:00 (9:00 PM) Permabless 2 Can't be added to unholy metals or unholy scripted items. 21:30 (9:30 PM) Dwarf Healer Tattoos 2 Tattoo is applied to the neck. Dwarf uses herbs to heal you. 22:00 (10:00 PM) Fusion Slot Increase 10 +1 slot upgrade to fusion gear. 23:30 (11:30 PM) De-fusion 5 Remove fusion script. 01:00 (1:00 AM) Creature Bane 10 Pick a specific creature bane. Example Ithzir champions or war griffins. Flares only. 02:00 (2:00 AM) Snake flares 10 Poison, paralyzing, or random flares (snake added to description). 09:00 (9:00 AM) Ironwright 5 Pick 2 flare types from a list. 10:00 (10:00 AM) 5 Year Enhancive Charge 3 Add a charge that lasts 5 years. Scripted enhancives like fusion and adv. badges will not work. 13:00 (1:00 PM) Body Features 25 Body features that you design, ALTER 27. 13:30 (1:30 PM) Resistance 25 +10 resistance, cannot be split. 300m cap cost, cost variable with item properties. 14:00 (2:00 PM) Briar flares (Tier 3) 1 Tier 3 Briar weapon. Weapon can be existing or made new. 15:30 (3:30 PM) Poison Flares 5 Poison flares between 5 and 15 points of poison damage when set off. 16:30 (4:30 PM) Rare Flares 5 Crush, puncture, slash, unbalance, and grapple. 17:00 (5:00 PM) TD Bonus 10 +5 TD to armor or shields. 17:30 (5:30 PM) AS Bonus 5 +5 AS to armor. 20:00 (8:00 PM) Enchanting Potions 2 Three potions with (8x) 10, (9x) 11, and (10x) 12 doses. 20:30 (8:30 PM) Partial Enchants 25 +2/+3 to an item that is already at a partial enchant. 21:00 (9:00 PM) Briar flares (Tier 1 and 2) 10 & 5 Tier 1 and 2 Briar weapon. Weapon can be existing or made new. 22:00 (10:00 PM) Partial Enchants 25 +2/+3 to an item that is already at a partial enchant. 00:00 (12:00 AM) Resistance 25 +10 resistance, cannot be split. 300m cap cost, cost variable with item properties. For the course of the event, the WPS smithy will be available to use with the cost of services done for silvers only. There is a 100,000 silver only entry fee to get inside. Once inside, the smithy will accept silver or notes. There is no limit to the amount of WPS services you can apply to an item at this event or the total amount of items you can work on. There will be an estimator NPC outside of the smithy to allow you to get quotations before entry. Q) Are there any costs to enter CCF? A) No, but you must have a paid subscription. If you're F2P you won't be able to enter. Q) What if my item needs to have a property removed to apply the service? A) As long as the property is not an inherited item property (ex. white ora being holy), overwriting the property should be possible. Q) How is this CreatureBane different than others offered? A) This one isn't a group of creatures like Ithzir, Extraplanar, or Undead. This one specifically targets one creature archetype. Bandits and Grimswarm are considered one creature archetype in this example. But outside that you'll be picking things like war griffins (not all griffins) or Ithzir champions (not all Ithzir). Flares can be any of the common or uncommon flare choices. Q) What spells are available for [service]? Q) What resistances are there? A) Slash, crush, puncture, heat, cold, electric, plasma, disrupt, impact, balance, grapple, vacuum, acid, steam, disintegration, and nature. Q) What does premade item mean? A) For the weapons, you pick a weapon profile and the item is created. For the X/day items, you can pick a worn location (or not worn at all). Q) Can I add the weight reduction script if I don't already have it? A) Yes. You can also add the 5% to an existing one to make it even better. Q) Can you give any prices yet? A) Pricing is going to be difficult to share because combat effectiveness is going to play a role in how much something costs. If you have 9x wondrously crit weighted RotFlare returning axe and want to enchant that to 10x, be prepared to pay probably some of the highest silver costs you've ever witnessed. We're going to try to stabilize the cost differences between weapon profiles and armor profiles, but it won't be a flat cost. The selection process for a service will not be included in the cost of the service except for services that are auctioned. I can tell you right now, the Glamour Tattoo will be auctioned. For things with more of a flat fee, I'll try to get those out there soon. Q) Can we get some clarity for the surcharges? A) Okay, after thinking about all this, we're going to standardize how the surcharge works, and I'll disclose the upper tier numbers. The surcharge is going to follow the item, not the account. Services that are not item based will follow the character (like spell preps and tattoos). The surcharge for multiple services to a single item/character service will be 5mil, 25m, 125m, and 625m. After this point, if you think you can afford another one, we'll have to figure out how to proceed because banks can't hold that much silver without breaking the game. Again, you might think the surcharge is silly, but it's a middle ground over 1 win and nothing more.Please see pricing & surcharge section above as it's now based on new information released by Wyrom 5/4/2018. Q) Will there be any sort of item limits per account? A) Due to the surcharge change, this is still TBD.Please see pricing & surcharge section above as it's now based on new information released by Wyrom 5/4/2018. Just wanted to say thank you to everyone who made it out. I know it was a bit chaotic with the crashes. Hoping we'll be able to learn from it all and make experiences with 125+ people in one room better. We drained close to 20 billion silver in Prime. It's possible for that number to be a bit higher if some data was lost during all "fun pauses" on Saturday. We drained over 1 billion in Platinum. I'd like to thank GMs Haliste and Thandiwe for assisting me with the grounds. While the services were the focus, the big thing for me was creating an area that captured the essence of what happened to Coraesine Field. I hope the area leaves a lasting impression of cause and effect. Approvals were made by GMs Coase, Estild, Kaikala, Tamuz, Galene, and Wyrom. Platinum's weekend was made possible by GMs Haliste, Thandiwe, Tamuz, Naionna, Skhorne, Kaikala, and Wyrom. Prime's weekend was made possible by GMs Haliste, Thandiwe, Aiza, Galene, Mazreth, Necios, Kaikala, Kenstrom, Elidi, Tamuz, Naionna, Lydil, Valyrka, Elysani, Mariath, and Wyrom. Special thanks to the GMs who helped out in the background, whether it was tackling a bug or dealing with the crashes. This will conclude the Coraesine Field/Forest events. This page was last modified on 15 May 2018, at 23:19.